Today I took a little walk along the Meramec River Greenway near Old Town Fenton, with my Pentax *ist digital SLR on my neck. It was a bit overcast and getting ready for rain. 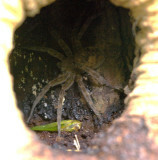 I love those huge ancient sycamore trees along the path, and was surprised by the spider living in the hole... probably the largest live spider I have ever seen in Missouri. 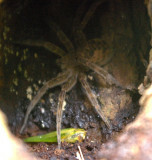 I held a finger nearby and could see that the spider's leg spread was a bit more than 4 inches in diameter. Sorry but it will give me nightmares!!! You know my fear of spiders!!! That spider's sure an eye-catcher! I also love the bark on sycamores. The spider is quite large, good shots and a good eye also. I love your artist's eyes. What an amazing spider! Scares me!